Various statistics and reports are available in Blueshift via UI, Campaign APIs or Amazon S3. 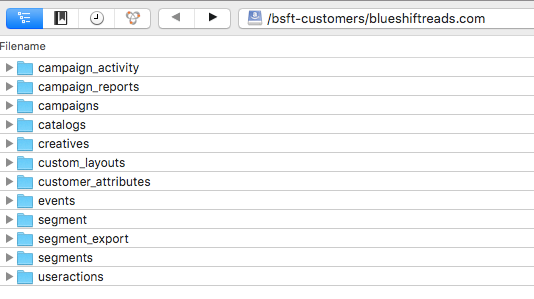 Blueshift automatically saves all of the reports available in prior section (campaign activity, segment, template) in an S3 bucket for each account. The account Admin role can access these S3 folder credentials from the Account settings page. You can then import this data for your own custom workflows or data warehouse applications. Cyberduck and Transmit are open source clients for FTP and SFTP, WebDAV, OpenStack Swift, and Amazon S3 but you may choose to use any application to get to these folders. 1. On the bookmarks bar choose to add a "new bookmark"
- Set the path. For this example, we will set this to as "/bsft-customers/blueshiftreads.com"
Once you enter you should be able to view your folders.